These Slow Cooker Korean Short Ribs are ridiculously easy to make and only require 15 minutes of preparation! Fall-off-the-bone tender and packed with sweet and savory flavors, these ribs are addictively delicious! This post was originally published in March 2015. I’ve updated the post below to include more information about this Korean Beef Short Rib recipe. Plus, I took new photos and added a recipe video to show you how easy these crock pot short ribs are to make! I have been on a serious Asian food kick lately. Asian food is just mega flavorful, and I legit cannot get enough! However, I am not quite sure Boy shares in my joy of this 24/7 desire to eat Asian food. This is probably because I keep sending him to the Asian market near our house, which can be a little bit overwhelming. Not only is everything in the Asian market written in another language, it is also seriously cluttered and can be rough for someone with severe O.C.D. Despite the markets somewhat intimidating vibe, I personally find the store charming, especially the back corner of the market. This is where there is a humongous counter of freshly caught fish, lounging and glistening, on huge bins of ice; floor to ceiling tanks of live lobsters and crab; freshly roasted ducks hanging from hooks, and case upon case of freshly baked Asian pastries and sweet treats on display. I mean, it’s heaven on earth for a foodie! I could, and have, spent all day in the Asian market. And that, friends, is exactly why I have to send my better half to the market. Because, who knows when he will see me again if I dare venture there. Anyways, have no fear. Today’s delicious dish does not require you live near an Asian market. All the ingredients for today’s recipe can be found at your local, run of the mill grocery store. I made sure of this, because I did not want you to miss out on these spectacular ribs! 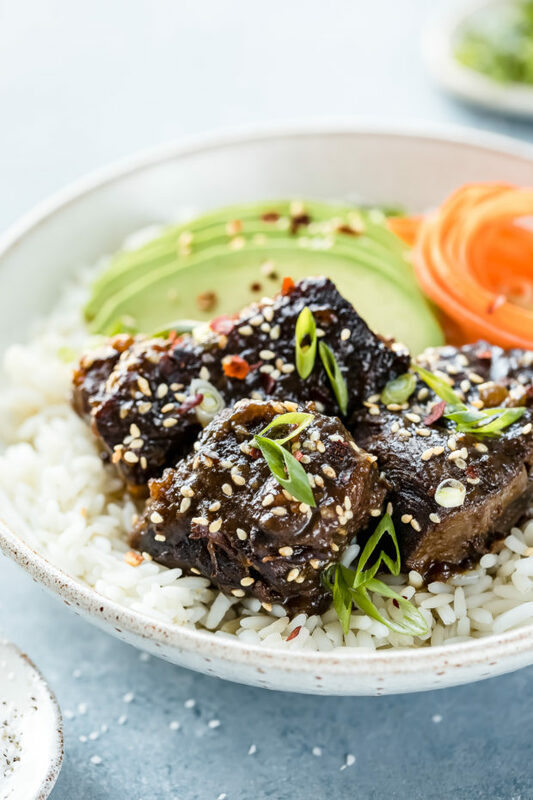 Staying true to what I love most about Asian cuisine, these Korean Beef Short Ribs are packed with a harmonious, symphony of flavors! The short ribs have a golden brown exterior and a melt-in-your-mouth tender, juicy texture. Smothered and swimming in a sticky, slightly sweet, and umami packed sauce, these ribs are full of flavor!! 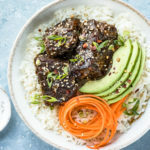 Sprinkled with nutty sesame seeds and fresh scallions; then served with fluffy rice, creamy avocado and crisp, shredded carrots, these crockpot Asian Short Ribs will blow your mind! Honestly, these Korean Short Ribs are so divine, Boy was trying to convince me to sell them. 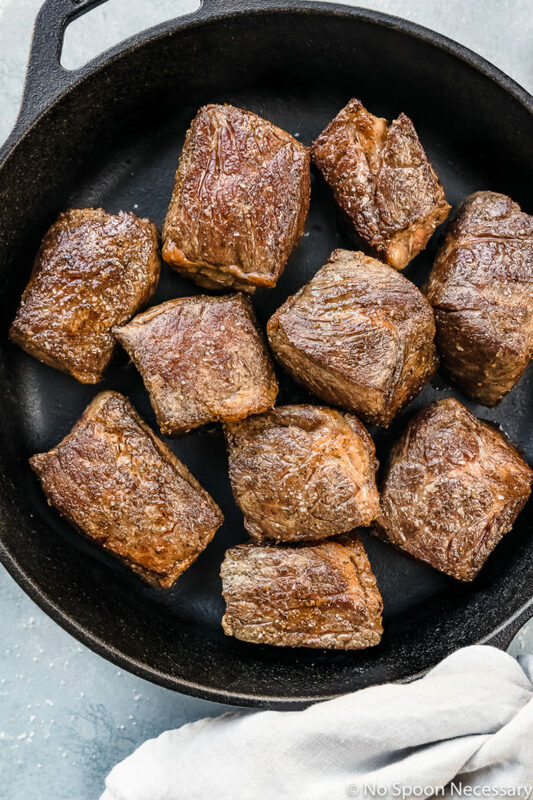 Aside from these short ribs being everything in the taste department, they are also a cinch to make, since you can set them and forget them in the slow cooker. Also, the ribs can be made a day in advance, which actually I recommend. Not only do the ribs taste better (if you ask me), it is also makes a healthier sauce, since the fat will naturally separate in the refrigerator overnight. The next day you can just scrape the solid fat off of the top and discard. Easy-peasy! What are Korean short ribs? There are a couple different types of Korean short ribs. One type, known as Kalbi, Galbi or Korean barbecued short ribs, use flanken style of short ribs which are grilled or broiled. This cut of beef is thin and goes across the bone so that each slice contains a thin piece of meat and a few pieces of bone. The other type of Korean short ribs, known as simply Korean style short ribs, use English style of short ribs. This style cut the ribs between the bones. Korean style short ribs can use bone-in English style, which come from the plate of the cow or boneless English style short ribs, which come from the shoulder of the cow. Each piece of English style bone-in short rib has a thick bone with a huge portion of meat attached, while boneless English style short ribs is simply a huge portion of rib meat without any bone. Are Korean short ribs beef or pork? Korean short ribs, or Korean-style short ribs are usually made with beef. If pork spareribs or another type of meat is used, the dish is named something else entirely. How many Korean short ribs in a pound? Short ribs are typically sold in rectangular pieces 2-4’’ long. Short ribs have a thick layer of meat and are well marbled which yields a rich flavor. While it greatly depends on the size of the ribs, there are approximately 3 boneless short ribs or 2 bone-in short ribs in a pound (English-style). And, for flanken-style short ribs, 1 rib is roughly ¾ of a pound. How many Korean short ribs per person? The number of Asian short ribs per person will greatly depend on the appetite of your guests. With that said, for boneless and bone-in short ribs, you should plan on about 2 per person (or 2/3 of a pound boneless short ribs per person and 1 pound bone-in short ribs per person). For flanken-style short ribs, you can plan on 1 per person. Are Korean short ribs healthy? Korean beef short ribs are definitely luxurious, comfort food. 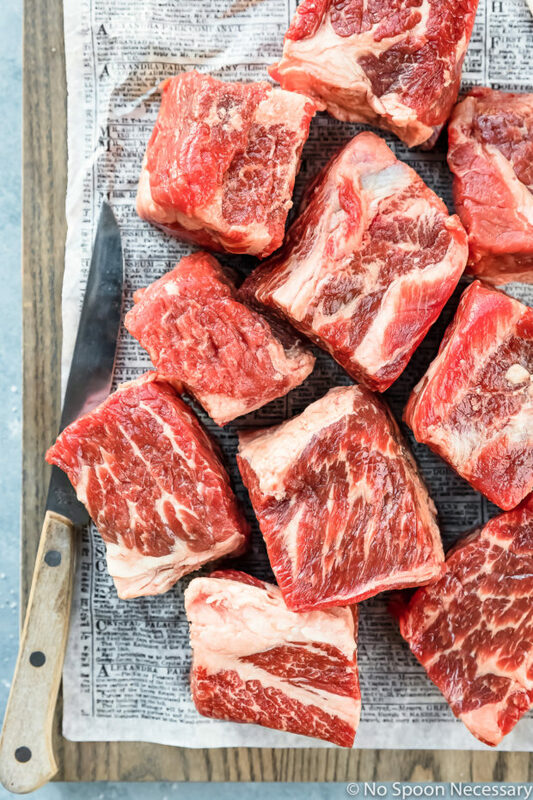 While short ribs are rich in protein and nutrients, they are high in fat. However, you can use boneless short ribs in this recipe which contain less fat than the bone-in variety. 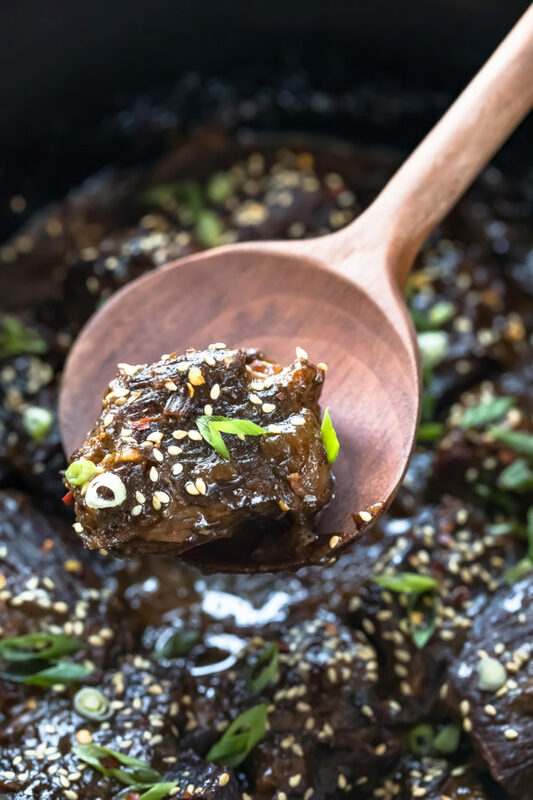 To make these slow cooker Korean short ribs even healthier, I highly suggest you either strain the sauce through a fat separator, or you make the ribs one day before you plan to serve them. If you make the ribs in advance, place the ribs in one airtight container and place the sauce in a separate container. Store both containers in the refrigerator overnight. 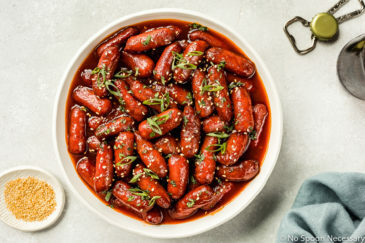 Before reheating, remove the sauce from the refrigerator and use a large spoon to remove and discard the fat that has accumulated on the surface of the liquid. What goes with Korean short ribs? 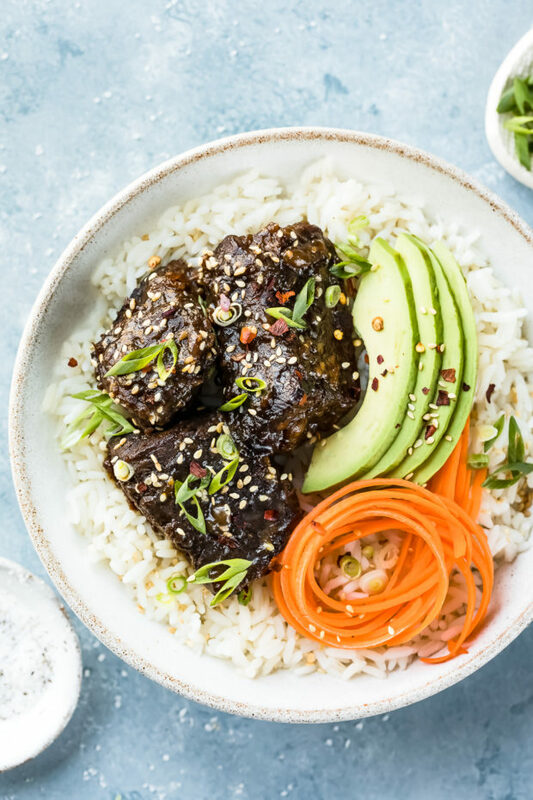 While I have served these crock pot Korean short ribs as part of a bowl complete with veggies and a carbohydrate and as a lettuce wrap, you can serve them with numerous, tasty sides! It is important the ribs be close to room temperature before searing. Cold ribs will brown unevenly, while room temperature ribs will become an even, beautiful brown. Sear the ribs in batches if necessary to not overcrowd the pan. Add the oil as necessary between batches. Overcrowding the pan will result in steaming the ribs, instead of browning. Ribs can be seared a day in advance. Store them in a zip-closure bag in the refrigerator and allow them to come to room temperature on the counter before proceeding with the recipe. To reheat Korean ribs leftovers, remove them from the sauce. Preheat oven to 300 degrees. Place ribs on an aluminum foil lined sheet pan. Bake, turning over once or twice, until warmed throughout, about 20-30 minutes. 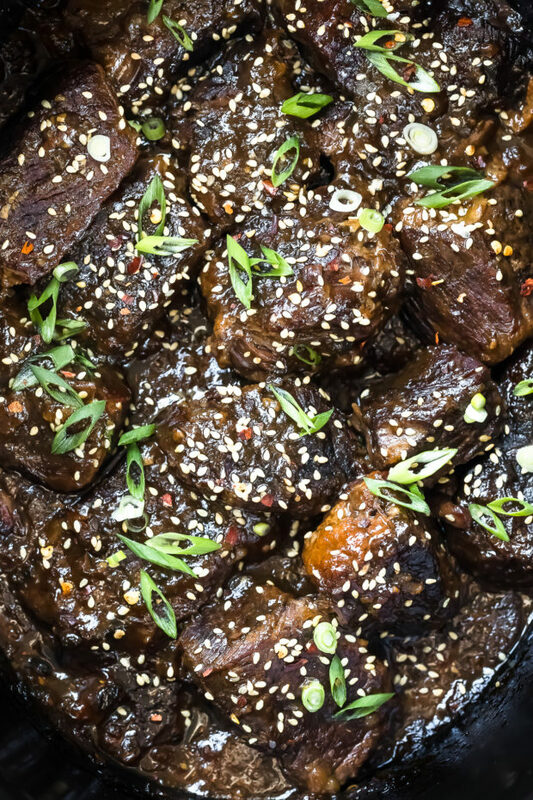 Scroll down, print out this recipe and make these Korean Beef Short Ribs! Fall-apart tender and crazy delicious, I pinkie-promise you won’t regret it! 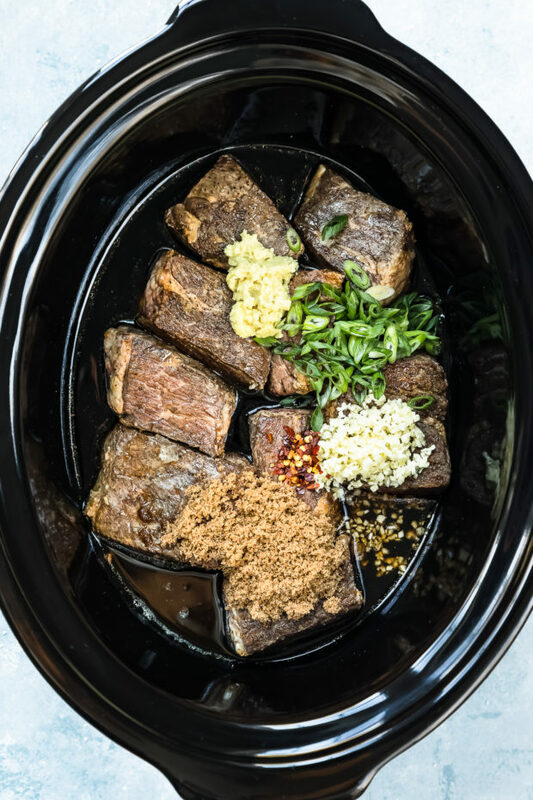 These Slow Cooker Korean Short Ribs are so easy to make and only take 15 minutes to prepare! These ribs are fall-off-the-bone tender and packed with sweet and savory flavors! Dry and season ribs: Pat the beef ribs using a paper towel and season generously with salt and pepper. Sear ribs: Heat olive oil over medium-high heat in a heavy bottomed stock pot or large cast iron skillet until shimmering. Add ribs and sear until browned on all sides until browned on all sides (about 3 minutes per side)*. don’t disturb/move ribs while browning on each side). Use tongs to remove ribs and transfer to a slow cooker. 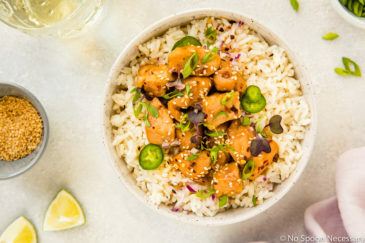 Make the sauce: In a medium sized bowl, whisk together the soy sauce, apple juice, sugar, mirin, sesame oil, green onion, garlic, ginger and pepper flakes. Pour the sauce mixture over the ribs in the slow cooker. 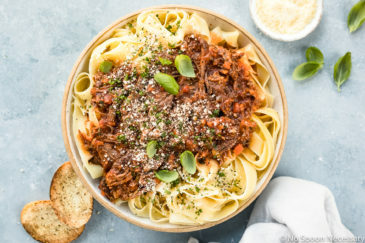 Slow cook: Cover the slow cooker and cook on LOW for 6-7 hours or HIGH for 3-4 hours, or until the meat is extremely tender. Serve: Garnish with sesame seeds and sliced green onions if desired. Serve and enjoy! This definitely puts any other short rib recipe on the back burner! 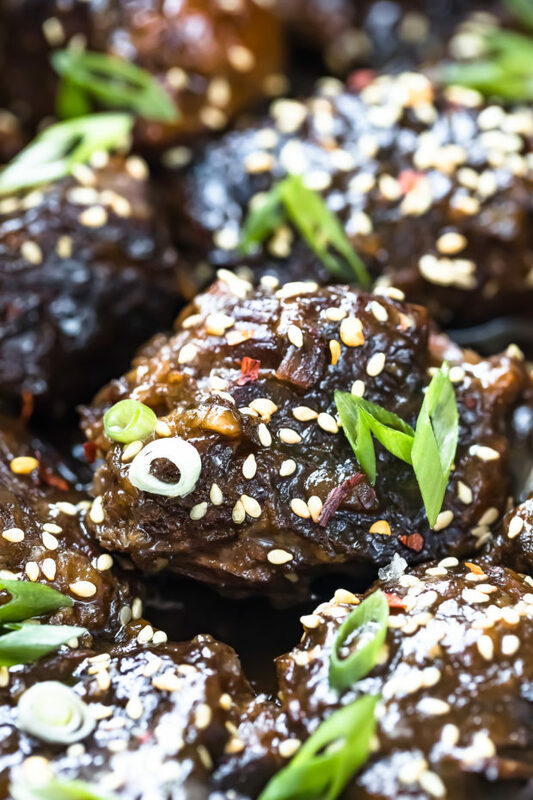 These Korean short ribs are one to try out SOON! I see why you send your guy to the store – I’d come out having spent WAY too much money in a place like that! I’ve been on a Korean food kick recently – where has it been all my life? So your timing is perfect. So excited to try these spectacular short ribs! Cheyanne, these look wonderful! So tender and flavorful – definitely making these soon! We LOVE short ribs Chey! And I think we both have Korean food on the brain, because I’ll be sharing something Korean this week too. You know Tom always loves when I break out my slow cooker. Can’t wait to give this recipe a try! I feel you when it comes to spending too much time in the Asian market! The one near me is mind-numbingly chaotic but that’s part of its charm and it’s way too tempting to try a million new ingredients (even if I can’t totally tell what they are based on their labels). Anyway, I love the sound of these short ribs! And I love that they’re made in the slow cooker! My children used to call the Asian markets “The Stinky Store” when they were young. As they grew older, they appreciated what those stores had to offer. These short rib lettuce wraps look fantastic! They are a mouthful of wonderful flavors and textures. Thao – lol, that sounds like something my husband (Boy) would say… He is like a big kid at heart. Asian markets are underapprechaited, they have so many wonderful ingredients and foods to offer at a much cheaper price! I love them! Thanks for the continued kind words and stopping by! Cheers, my friend! Hey! I love your food photography! 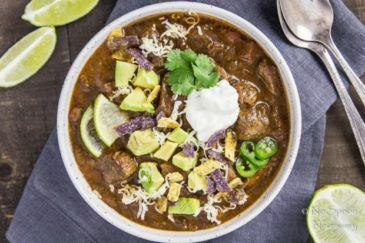 I saw this recipe on Brit+Co too! I’m curious why your photos are so small? I think it would be awesome if they were the width of the blog post! Dude Asian markets are what’s up! There is one a few towns over that is so clean you could eat off the floor, they have everything you’re looking for, and everything you didn’t know you needed but MUST have. Love the recipe, super creative, amazing pix per the Chey norm, and making my mouth water wicked bad:P Keep up the good work. Adam, I figured you would share in my Asian Market love! I totally get the “oh oh, I MUST have that” mentality lol… great minds 😉 Thanks for the kind words, as always! Cheers, buddy! I could literally eat these every day, Cheyanne, they look perfect!